The bread and butter of any Double Wing(DW) attack is Super Power. 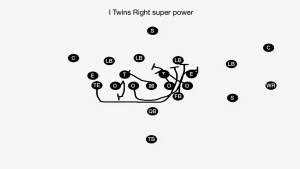 Traditional Super Power is the same as the standard power I described yesterday (play side down blocks, with a FB kick out, and a back side guard wrap) but the SUPER in super power comes from adding an additional puller/wrapper. 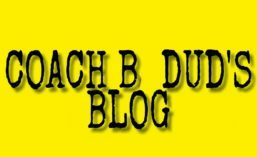 Now usually, DW teams use guard and tackle as pullers and have TE cut block to stop backside pursuit of the play. We pull on super power a little bit differently, we pull the backside TE as the second puller/wrapper. This gives us a few advantages, we are pulling a faster, more athletic kid who can get to the hole quicker and has better feet to be able to redirect to pick up a LB. It also lets us keep our back side tackle home with his usual protect b gap and hinge. This means no new teaching for our back side tackle, in fact ours has no idea what the difference is between power and super power. Keeping the backside tackle at home and upright is a more powerful block and I feel does a better job at sealing off the back side than the TE cut block. It is key for the BS TE to get depth on his pull, and re enter the LOS square. Ideally, when the guard gets through the hole he looks head up to outside, and the TE looks head up to inside. Now we didn’t do this from a DW set, we did it from our base 21 personnel pro pistol set. Here is some video of us running super power. Please excuse 2 of the clips, our camera guy started a little bit late so you miss the very beginning but you can see us pull both BSG and BSTE through the hole. Coming tomorrow, 1 back power! This entry was posted in HS Film, Offense, Offensive Line, Pro, Run Game. Bookmark the permalink.